Indo western attire, Complete Site layout, Information about our accessories, Complete Store Info. Indo western wear and Indian ethnic clothing shop for women and gents in SF bayarea. Fashion wear from India, Indo western clothing, Indo western dresses, ethnic indian mens sherwani, salwaar kameez, Boutique saris, Brocade and simmer saree blouses, Long sleeve sari blouse, streachable blouse, kurtis, ladies garments, long dresses, payjaabs, Tikkas. 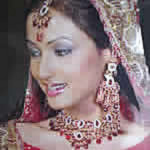 Indian accessories, fancy bangles, duppattas, necklaces, Indo jewellry, sarees, patiala kameez. The latest fashion trends all draw from the exotic indian clothes, with exquisite embroidery, beadwork, hand work and tie-dye fashions. At Bibi's Fashion shop you can buy the authentic India clothing, matching necklaces, fashion bangles and earrings. Designer boutique sarees with blouses, Pasmina shawls, gaghra choli and Tv series inspired latest fashion apparels originating out of Bollywood India. Ladies Indo desi fashion wear, salwar kameez, latest lenghas, Boutique sarees, shalwars, traditional India wear, latest sarees with fancy blouses, bollywood clothing, girls lehengas, chunidars, salwar kamiz. Wedding dress, Bridal sarees, designer style bollywood designer fashion wear. Indo western clothes, Designer Sari Blouses, Fancy short and long sleeve streachable Sari Blouse in S,L,XL, & XXL sizes. Fancy plazzos, Kajuri salwaars, Lots of fancy and plain Duppattas. Men's Sherwanis, kurtas - pajama, kameez salwar, jodpuri, prince suits. Prince Hats - Pugri the traditional Indian men's wedding hats for wedding receptions, boys sherwani, boys casual outfits. Fashionable clothing accessories, Designer bangles, duppattas, karch bangles, bracelets, kurtis, Costume necklaces, henna tattoos, bindis, tikkas, payjabs, anklets, kaajal, eye liner, bangle holders, rhinestone bangles, fancy earrings,Kumkum , glass bangles and body decors. Silk cushion covers, tasbi, aktar,Muslim Head wear, fancy shawls, mens duppattas, Boys phatani suits, Fashion evening purses, Fancy dangles for sari blouse, Silver and gold saris bags, ladies tights, Petticoats, toe rings. Peacock Rings. More Info on our Indo clothing store. To get notified of new arrivals, Like Bibisfashion on Facebook. Visit our Yelp Page to enter reviews, Email us. Thanks. Located in East Bay - 27518 Tampa ave Hayward Calif. Ph# 510.786.3324.